There was a distinct buzz in the air immediately following the dialog session (Finally, a CGIAR Reform Initiative with Legs) between the CGIAR Transition Management Team (TMT) and the group of communication specialists attending the second day of the CGIAR Strategic Communications Workshop in Penang, Malaysia. A shift in perceptions had been brought about by the open, straightforward discussions that had just taken place. 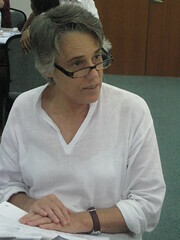 Susan MacMillan, Head of Public Awareness, ILRI, was not alone in thinking that the candor of the TMT was refreshing. For the first time, she felt there was a distinct possibility that the communication specialists would be able to contribute to the CGIAR change process. As she said after the dialog, “It always pays to be more straightforward, because you’ll get people’s engagement. The four TMT members said it the way it really is. For example, we heard them say that, yes, the CGIAR change process has been donor-driven. Part of Susan’s optimism has to do with some of the things said by TMT member Jonathan Wadsworth, who brings a donor perspective to the Team. “Jonathan said the reason this reform initiative is different from previous CGIAR reforms is because it has legs,” she explained. “That bit of exciting news – that this change process, unlike former ones in the CGIAR, is going to go to the very end of the change process – has been missing in the CGIAR Change Management newsletter, blog, website and in messages from CGIAR Chair Kathy Sierra. Susan feels that face-to-face meetings are necessary to gain the trust of CGIAR staff. “With about 10,000 people spread across the CGIAR Centers, real-time meetings with everyone would be impossible, but we mustn’t discount the effectiveness of such interactions,” she said. “For example, I first heard Ren Wang speak when he delivered an 8-minute talk to my Center’s entire assembly of staff. Although I was impressed with what he had to say and how he said it, his message wouldn’t have had the same impact conveyed in a blog or a newsletter. Perhaps we could communicate messages using videos. The Spider Diagram method is a “quick and dirty” way to get a useful snapshot about how participants evaluate a workshop. Use it along with interviews and if necessary in addition to a more formal survey. It allows you to give participants an immediate visual impression of the group’s thinking related to an event. We used it this time to get an idea of how the group felt about the accomplishment of the workshop objectives and the different sessions of this 3 ½ day event. Did we accomplish what we planned to do? “Identify a set of story ideas”: Definitively yes. “Identify means, incentives, and opportunities to strengthen collective communications”: participants agree that this was achieved “more or less”. “Develop a work plan for 2009 collective communications”; And “Provide input into the CGIAR Reform”: Some say yes, some say more or less. How did the different sessions go? The two opportunities of a dialogue with the Transition Management Team where highly appreciated and got the best rankings. The River of Life where Nathan Russell, with the help of many long time members of the group, reviewed the history of the different attempts of collective communication actions in the CGIAR. The Speed Open Space where participants could share and learn more about other’s peoples work and ideas in 20 minute parallel sessions. The presentation by Helen Leitch (WorldFish) on the results of WorldFish’s CGIAR center survey on Communications. The story development session led by Jeff Hawskins from Burness Communications. The collective effort to set up and prioritize a work plan for 2009. 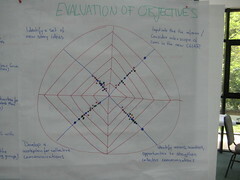 The one single session that received mixed evaluation was the Samaon Circle on Communications in the New CGIAR. Was it because of the topic or the format of the session? This is something we still need to figure out. 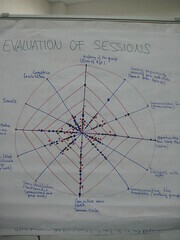 Social, Logistics (thanks WorldFish) and facilitation got very positive rankings. I was happy to meet Susan MacMillan, Head of Public Awareness at ILRI, in Penang at the CGIAR strategic communications meeting. We had met for the last time at AGM08 where she attended the first day of the Knowledge Management, Education and Learning Workshop. That event had kicked off with a presentation by Steve Song from the Shuttleworth Foundation. Steve introduced participants to the fundamental changes around Web 2.0 tools. While I was fascinated by his talk, I was wondering what Susan was doing in the back of the room, very actively typing in her lap top. I am ashamed to admit that I thought she was doing email and not paying attention to what I considered as a crucial opportunity for the participants and the research and development community as a whole. Later on, Susan shared with me the amazing article which she had written for ILRI’s Intranet during Steve’s presentation about the potential of web 2.0. Very kindly Susan authorized us to publish the text as a blog post. Now, meeting again in Penang I was even more delighted about her telling me how much this presentation had impressed her and opened the doors for ILRI’s path towards social media. While she became an ambassador for social media in her center, the Webteam already plans an ILRI Web site renewal based on the principles and tools of social media tools. The second example could be called CIP 2.0. 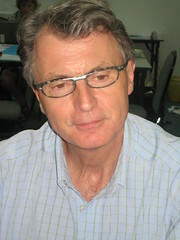 While Paul Stapleton, CIP’s Head of Communications and Public Awareness, was one of the first to sign up for the recent social media online workshop, we discovered that he uses social media a lot for personal purposes, but hasn’t started to consider it for CIP’s communication processes. That changed quickly during and after the workshop: Paul was immediately part of the CGIAR Yammer group that was created during the Penang meeting, and has become a daily user of it. Once back in Lima, he included social media ideas into a presentation to his management, who got very excited about the prospects and so Paul is going to start a wiki for them. Those are very encouraging examples for all of us who are working towards the use of innovative communications and knowledge sharing tools and methods. Thank you Susan and Paul for your open minds and enthusiasm! Want to find out what was cooking at the CGIAR Strategic Communications Workshop in Penang, Malaysia? Then you can have your say, simply by leaving a comment or two. What Gets our Communications Leaders Excited? A previous detailed post about the meeting of the communications group with the Transition Management team (TMT) in Penang already gave an overview of the fruitful interaction that has been going on in Penang during the strategic communications workshop of the CGIAR. I didn’t realize that we would meet all the Transition Management Team members and have an in-depth conversation with them. So that was the best part of the workshop: to see that there is a vision, that the changes are really going to take place, and that communications has a role to play in the change process. I also liked the social media exposure, because that’s something new for me. I’m excited to continue with that when I get back to WARDA. The meeting was really participative and focused. I have been to other workshops where some people talk too much, and others don’t get a chance to speak. Simone Staiger-Rivas’s facilitation kept us focused and got output from everyone. Sometimes, we thought, “Ooh, she’s not letting us speak”, but I think it’s good to control the group. Otherwise, there wouldn’t have been enough time to cover everything. It happens a lot during meetings. In fact, the only problem was the lack of time spent on the new story ideas that are already on the calendar, but we can probably continue those via email. I think Simone Staiger-Rivas’s facilitation was very good. Few of us were restrained about making our opinion heard, so Simone did a very good job of controlling us. She made sure everyone spoke in turn and guided the contribution. So I think most people were happy with the discussion part of the workshop as well as the presentations. Nonetheless, I feel there should have been room for a discussion about the future of the communications group. If we could form a group with a clear identity, we might be able to make our voices heard in the CGIAR. I came to Penang to see how CGIAR communicators can work together better in the future, whatever the form of CGIAR change. After hearing the Transition Management Team talk, my early skepticism about the change process was mitigated somewhat. The meeting was very productive, both for my own particular work agenda and, in my opinion, for the CGIAR. After not having interacted directly with the other communicators for quite some time, I was newly impressed with their professionalism, their knowledge and their enthusiasm to work together. 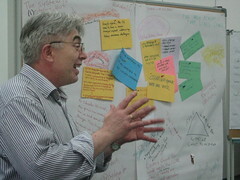 The workshop facilitation was very effective for what we needed to do. It helped bring out good ideas and got people working together on a common agenda. One particular aspect of facilitation that I hadn’t seen before was the Samoan Circle. I thought it was interesting and fun. I’ve only been with IRRI for six weeks, so I appreciated the importance of having a network of professionals and expertise coming together. Sessions like Nathan Russell’s that provided an historical perspective were really useful for a newcomer like me. It helped to understand where the organization has been, the support communications has received over the years, and the individual experiences and expertise. I came into the workshop without knowing anything about the CGIAR change process, so trying to understand that, the communications of the change process, and who was responsible for what, was confusing at times. But the discussions within the communications group and with the Transition Management Team have clarified that somewhat. The communication group’s positive outlook and willingness to contribute to the greater good, while continuing to get support for communications, was impressive. A community of communications professionals is very important. The group’s feedback into the transition process is a positive step in ensuring that the expertise within the network is in the System – I can benefit from that, too. Before the workshop, I’d hoped to meet with the other CGIAR communicators to talk about story ideas and also to see if we could have some interaction with the Transition Management Team (TMT). What we actually achieved exceeded my expectations. I was really impressed with the TMT’s openness, the way they took on our ideas, and the intensity of the interaction between them and the communications group. Last year, we came together as a communications group to work on specific story ideas for the media. But it’s been two or three years since we’ve met to really think strategically and work on a plan. So it’s been nice. Simone Staiger-Rivas did an excellent job in keeping the energy going and allowing people who are quieter to actually participate. Had the workshop not been facilitated, it would have been hard to hear everyone’s voice – in previous meetings, you’d have to fight for attention. I think overall the results were very good and the meeting has recreated the team’s enthusiasm and energy to keep it going, which I think is important. Simone Staiger-Rivas has an intensity about her that leaves a mark on almost everything she does. She knows nothing about half measures or being just good enough. At least, not when it comes to her work. And once again, this knowledge sharing exponent was in top form as she went about her business helping to facilitate the recent CGIAR Strategic Communications Workshop in Penang, Malaysia. The event, which brought together communications experts from almost every corner of the CGIAR System, took place a few short weeks after many of the same participants had taken part in a two-week online workshop, which Simone also helped organize. Simone had also hoped to examine the different ways in which social media can contribute to the new CGIAR. The feedback from the online event was mostly positive, and thus it was a buoyant Simone who arrived in Penang, eager to meet the participants face-to-face again. Simone used a number of different workshop dynamics in Penang: River of Life to review the past and prepare for the future; Samoan Circle to reflect on communications in the new CGIAR; Card Sorting to prepare the matrix for the 2009 work plan; Spider diagram to evaluate the workshop; and a speed Open Space to share with and learn from colleagues. A popular lunchtime session was Simone’s demonstration of Twitter and Yammer (Yammer like a Twit). The communication specialists were duly impressed, to the extent that the group immediately created their own space on Yammer. The positive feedback from the Penang event was overwhelming: Here are just a few of the comments: “The best workshop with this group in 20 years,” said one participant. “It was fantastic. I am full of ideas,” said another. “The different session formats along with the facilitation helped us to achieve an enormous amount of things,” said yet another. Another notable testimony to Simone’s skills as a facilitator came after the first day of the workshop, when one of the participants announced that the facilitation approaches used had enabled him to achieve more in one day than he would normally achieve in a week. When this feedback was relayed to Simone, she simply smiled. Come to think of it, Simone probably deserves a few kudos just for hanging on in there.